Iris Apel, Fashion designer, interior designer, American Business women, who is currently a MAC cosmetic model at the age of 96!! 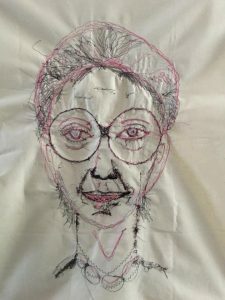 Sewing portrait of an Icon and a woman who I truly admire. Known for her famous style of dressing and large black rimmed eyeglasses . Using Free Motion Stitching, embroidery, watercolor on duck cloth. Won 1st Place at San Diego. Watch the tv documentary of Iris, which will endear you to love her and entice you to follow your dreams and enjoy life and your loved ones. Her husband was great force behind Iris, though deceased, she continues to live life to the fullest. She has redecorated many white houses and most of all for Jackie Kennedy, who they worked very closely together. 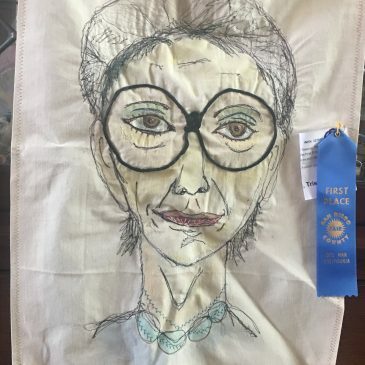 My sewing portrait is one of a kind. Collectors item. 16″hx14″w. duck cloth. Looped for hanging with a rod or nails. The background is just as interesting as the front. You get to see the underlings of thread or the psyche side of Iris Apfel.